I hope everyone is well and staying warm in this awful cold weather here in the UK. I have a quick share with you all today ~ if you are a regular follower of my blog you will already have formed the opinion that I am completely mad as far as my dogs go, but this extends to the rest of my family and Majik got a card and a cheque off her 'Nan' (my Mom) for her Birthday!!!! The brief was for the card to be simple in design but to convey the message succinctly. This is what I came up with, Majik was chuffed to bits and so was my Mom - lol. Thank you for stopping by today ~ have a nice evening. I hope you are all well and looking forward to the weekend. We have had the builders in for two weeks now and there is potentially still another week to go! I am fed up of being frozen to death as they constantly leave the front door open ~ by the time Hubby gets home I am so cold we need to light a fire to get me thawed out again ~ lol. Today I have a card which I made for Majik's 6th Birthday which was last week. As soon as I saw these Katy Sue Designs 'Shaggy Dog Tails' new stamp sets I knew I had to have them all. Although the dogs on the stamps are supposed to be Old English Sheepdogs ~ I knew I could adapt them to look like Bearded Collies. Majik enjoyed her Birthday ~ I made muffins and she had one with a candle in it! Thank you for visiting my blog and once again for all your lovely comments which are always much appreciated. Firstly, thank you for all your lovely comments on my last post ~ I do appreciate it. 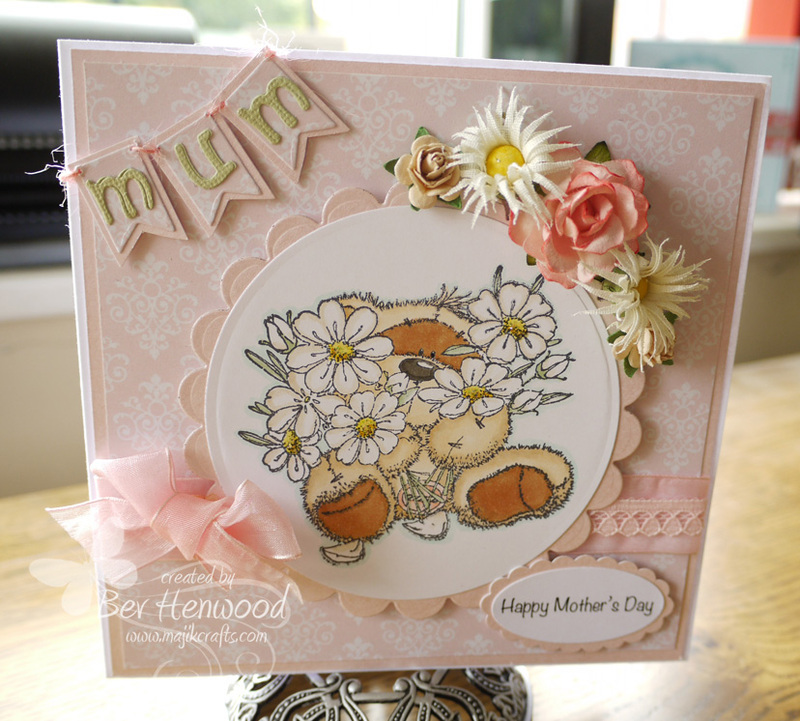 Today I have a quick post to reveal exactly why I needed four Mother's Day cards in total! One for Majik's Mom ~ Isla Beardie! I am going to be ultra lazy with this post and not list all the ingredient for the cards ~ but if anyone wants to know anything then just contact me and I'll let you know (providing I know where it came from)! I am in a hurry because the 'builders' are back and they are working in the loft where all the cables for the internet and literally everything else run through, so I am expecting to be discombobulated any time soon! The good news is Kai is back ~ he is an honorary member of the pack here having arrived at ten weeks old with Richard the builder when we had all the other work done on the house ~ he spent the first few months of his life running around with the Beardies in our garden and here is a photo of him. So, many thanks for stopping by ~ I will be back once these cables are sorted and I am connected again. I hope you are all well and dry! It is raining here ~ so Dog towels on duty again. Well, all my Motheris Day cards have been posted today (those that need to be posted that is), most people only have one to contend with I have four ~ don't ask!! All will be revealed over the next few days. So, today I am sharing the card I made for my actual Mum ~ she doesn't 'do' computers so I know there is no chance of her seeing it before the day. A funny story ~ when I first started making cards I made a card for my Mum, I can't remember if it was a Birthday card or a Mother's day card, but I had put a lot of effort into it ~ as you do. On speaking to her all she could say was "You could have put the word 'Mum' on it"...... what can I say? So, ever since then I have gone overboard with the 'Mum' bit on her cards and this one is no exception! Well, that's all for today folks ~ thank you so much for taking the time to stop by and of course for all you wonderful comments.